This picturesque Blood Orange Cake cake will wow everyone! It’s essentially a turmeric cake with stunning and delicious citrus on top! It’s an unexpected dessert that’s packed with flavor and buttery goodness. 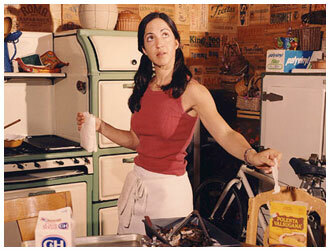 And in the winter, there are never too many blood orange recipes! Inspiration for my recipes comes from all over the place. Inside, outside, books, magazines, mood, weather . . . . It can be anything from the produce that’s in season and the temperature outside, to how I’m feeling, and flavors I’m craving. It can also be pictures in magazines, aromas in the air, what’s in my pantry, and a million things in between. For this recipe my inspiration was color. I wanted to paint a picture, if you will — of the fiery red of blood oranges and the brilliant gold of turmeric . . . in a blood orange cake, with turmeric. I knew the flavors would marry beautifully, and I just had to see those deep, rich colors together — in a cake! Sometimes a vision must be realized! A gorgeous color – Cakes with Turmeric will have a stunning golden glow to them. A delicious flavor – Turmeric has subtle scents of orange and ginger. The overall flavor is mild, though it can be a bit bitter. In a cake all of these elements are balanced and brought out with the sugar and rich butter. And add to all of that, blood orange cake, and oh my! Spectacular — as blood orange recipes typically are. You will be a star when you serve this blood orange cake at your next get together. That’s a promise! It’s beautiful inside and out! A turmeric cake with stunning and delicious citrus on top! Cakes with turmeric make for an unexpected dessert that is packed with flavor and buttery goodness! Preheat the oven to 350 degrees F, and adjust a rack to the center. Use a pastry brush, or a bit of the butter wrapper, to coat the bottom and sides of a 9-inch cake pan with the tablespoon of softened butter. Set aside. On a clean, dry surface, use a paring knife to cut about 1/2-inch off the top and bottom of each blood orange. Then to remove the skin, set them down on one of their flat surfaces and use a the knife, moving downwards, just inside the skin, cutting only slightly into the flesh. (Here's a photographic guide for cutting citrus this way.) Now, cutting horizontally into the blood oranges, create round slices that are about 1/4-inch thick. Place them on the bottom surface of the buttered cake pan, covering as much of the space as possible. The edges of the orange slices should be touching each other. Set aside. In a small saucepan, combine the milk with the freshly grated turmeric. (Here's How to Use Fresh Turmeric.) Place the pan over medium-high heat and bring to a strong simmer. Then turn off the heat, cover, and set aside. In a large mixing bowl, combine the flour with the baking powder, cardamom and salt. Set aside. In a medium-sized mixing bowl, whisk the eggs with the sugar and vanilla. Now strain the turmeric milk. 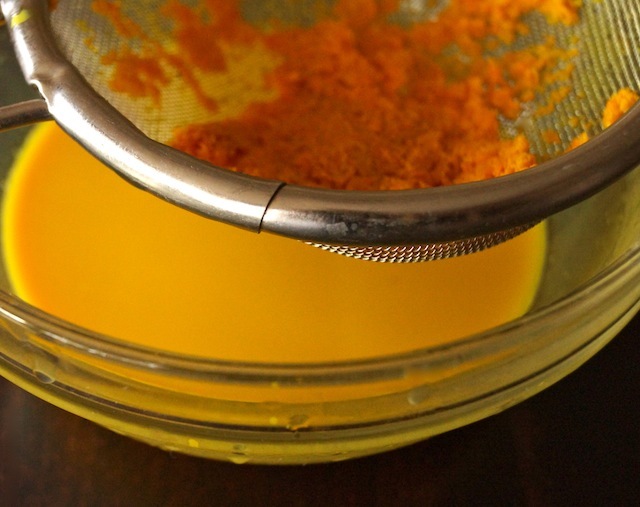 Use the bottom of a spoon to gently press on the grated turmeric to get as much liquid out as possible. Set aside. Make a well in the center of the dry ingredients, and pour in the egg mixture and the strained turmeric milk. Once it's blended in, fold in the melted butter. Continue to fold the batter until it's smooth. Pour the batter into the prepared cake pan with the blood oranges and place it on a baking sheet, and then into the preheated 350 degree F oven. Bake until it's golden and set, about 30 minutes. Gorgeous, Valentina! Just breath-takingly beautiful! The addition of turmeric is genius! What an outstanding winter cake! With such a bold presence of moist ingredients I’m not sure how to convert this recipe to Gluten Free Flour and Guar Gum. I’m concerned it would become a gorgeous but leaden hockey puck. Do you have recommendations? Wow, the colors in this cake are unbelievably gorgeous! I don’t think I’ve ever baked with turmeric, but I’m certainly intrigued. Thanks for sharing the recipe! Such a pretty cake, love the way the orange slices look on top! Oh you’ve achieved your goal of fire beautifully, your cake is stunning. Love the use of fresh turmeric in your cake too. Yay! Thanks so much for checking it out. Stunning! You’ve inspired me. I’ve got to try this combination — turmeric and blood oranges. Thank you so much! Umm wowing guests is an understatement! This cake is gorgeous! Such awesome colours… I’d love to try this but I don’t think I could make it as beautiful as you! What a gorgeous cake! I love baking with turmeric it reminds me of my grandmother’s turmeric cake so warm and comforting. It’s like a tasty sunset on a plate! So lovely! Is it possible to use ground turmeric in place of fresh? Yes, you can use ground turmeric. I’d use approx 2 teaspoons, and then no need to strain the milk. Enjoy! Wow such beautiful colors!! I’ve never had turmeric in a cake before — have to pin this! I love the look of this cake. Do you have any idea what might work as an egg replacer, or are there too many eggs to substitute? Hi Summer, I haven’t ever tried this with an egg substitute. I found this great “cheat sheet” for substituting eggs that I think will be really helpful. For this cake, I’d really try to stay away from substitutes with strong flavors — you don’t want to take away from the turmeric! 🙂 My instinct would be to try the flax first. Good luck! Hi Julia, You can use Naval oranges — and, you might see Cara Cara’s early Nov (but could be too early) — they’re a great pinkish color. The Navals would be lovely — just a different look. Enjoy! What a gorgeous cake! I have everything but cardamom. I really enjoy cinnamon orange tea. Can I replace cardamom with cinnamon? Want to try this tonight. Hi Kim, I hope I got to this in time — before you started baking. YES, cinnamon would be delicious! Go for it. 🙂 I hope you enjoy it.